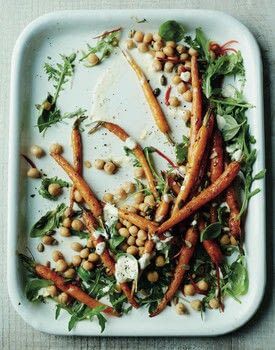 Sweet, sticky and spicy, here carrots are combined with chickpeas and toasted seeds, and served with a fragrant cream made with fresh orange zest and juice mixed with crème fraîche. Posted by Ryland Peters & Small • Published 27th September 2015 • See Ryland Peters & Small's 140 projects » © 2019 Nicola Graimes / Ryland Peters & Small · Reproduced with permission. Preheat the oven to 200°C (400°F) Gas 6. Put the carrots in a large roasting pan and drizzle over enough oil to coat, season, then toss them with your hands. Roast the carrots for 15 minutes, then stir in the balsamic vinegar and sprinkle the cumin seeds over. Return the carrots to the oven for another 15 minutes or until tender and starting to turn golden. Meanwhile, for the citrus cream mix together the crème fraîche, the orange zest and half the juice in a bowl. Transfer the carrots to a bowl. Stir the honey and remaining orange juice into the juices in the roasting pan until combined and then pour over the carrots. Add the chickpeas, rocket and chilli and toss until mixed together. Divide between 4 serving plates and arrange the basil leaves and toasted seeds over. Top each serving with a spoonful of the citrus cream.